As the weather cools down, the last thing that you might be thinking about is having a pool installed, but this is actually the perfect time to get the process started. Not only does this assure you of having your pool ready for a refreshing dip on the first hot day of 2019 but it also eliminates many of the delays and weather issues that can arise during a spring or summer build. And you certainly know exactly which features your family would love to have, as they were sure to have been begging for them all summer long. Even though it is perfectly acceptable to build a pool in the extreme heat of a Phoenix summer, there are certain challenges that must be dealt with to ensure the integrity of your UNIQUE swimming pool. The extreme heat in the summertime can make it very difficult to manage the curing process of the concrete. The heat causes the water to evaporate too quickly and requires regular water applications to avoid any cracking. And waiting until late winter can also pose issues as concrete should never be exposed to temperatures below 50 degrees during the curing process. Concrete pours during either of these extremes can be structurally weakened which diminishes the quality of the finished pool. Spring can have some unpredictable weather which could result in your yard being wet during your pool construction. We can still build your dream pool in these wet conditions, but there is likely to be more noticeable damage to your surrounding yard and outdoor living areas. Heavy equipment is used for some phases of construction and in wet conditions ruts and damaged turf are always possible. But now that we are past monsoon season and have relatively dry weather, construction will be far less destructive to your yard. And then in the spring, your grass and plant material will be at its best as you begin to enjoy your UNIQUE oasis. 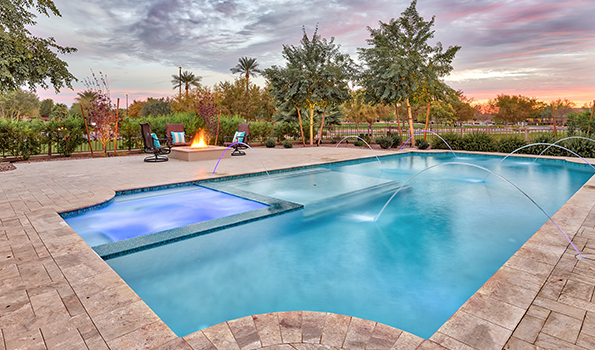 Call today at 480.969.1911 to schedule a free consultation with a member of the UNIQUE design team and let us create your dream pool for 2019!